A Pug's Voice – The Next Generation | A pug speaks eloquently, honestly, and freely about the joys and vicissitudes of his life. Grandma says I must write you a letter but I’ve been so busy I can hardly catch my breath. She said if maybe I stopped barking for a minute I would have time! I don’t know what it is about being on the Cape, but for some reason, I love to bark and bark and bark…usually for no reason except that it feels so good! Sometimes I like to lie all alone in the back yard and just bark…not a loud bark…just a steady low bark. Phillip thinks I am crazy because he only barks when there is an intruder or another dog barking. The big thing I have to tell you is that we’ve had these really huge dogs visiting the past two weekends…I mean REALLY BIG! Two are called Bernese Mountain Dogs (and believe me, Mama, they are as big as mountains!) and the other one was a giant chocolate Lab called Bucky. Bucky was too crazy even for me! This weekend the two Bernese (Canon and Caius) came back with a HUGE Greyhound named Whoopee. She was so beautiful and graceful…Grandma said she had “runway legs,” whatever that means. I have never seen anything in my life run so fast. Daphne, Phillip, and I tried to keep up with her when we chased the ball but she was a blur. So, here is my question for you…when will I get that big? I never minded being the smallest dog, but now I want those long, skinny legs and that long pointed nose just like Whoopee. She raced on a track and was abused…at least that is what Grandma and her other daughter talked about…until she was rescued by her present owners. They love her so much that they cook her special meals every day, buy her clothes for every season, and do everything for her. I was kind of jealous but she is so nice and sweet I couldn’t be. I tried really hard to keep up with her but I wasn’t even close. Even Daphne couldn’t and she is the fastest dog I know! At any rate, we are pretty tired most of the days from barking, playing, chasing Daphne, going for walks, going up and down the stairs, so that by bedtime we are done (as Grandma says). Camp is great and now that the weather is cooler, we are really happy. Leaves are already falling here because of the drought this summer so that every time we go out, the ground makes a crunchy sound. Miss you so much and can hardly wait to see you, but I am having a great time. I attached a portrait of us on National Dog Day. Something about the weather, the angle of the sun, the relaxed atmosphere that led Grandma to the cupboard for our stash of buffalo pizzles…They are stinky, foul smelling items but to us the greatest treat in the world. Daphne, of course, as our leader, would never dream of joining us on the grass for these delicacies. She always separates herself from the pack…something about maintaining a certain discipline and distance I think. She will inhale hers while we are still sucking and chewing away. Poor old Cecily though…because she is both blind and deaf, she loses hers easily and then she wanders around trying to find it. Grandma always keeps one eye on her though so she doesn’t harm herself. What a summer this has been for us Fresh Air Fund dogs…the most fun of all is playing Treibball with Daphne. Actually, it is Daphne who herds the ball and we just chase her, barking crazily. it is exhausting because she is so fast, chasing that ball through the woods, around trees, up and down little hills, all the while howling and screaming at it like a foxhound on the scent. When Grandma and Grandpa say we’ve had enough, we collapse with our little sides heaving and our tongues going in and out so fast from panting…but it is the greatest thing ever! I know some great big dogs are coming tonight and that worries me a bit…two Bernese Mountain dogs, and one huge Labrador…Grandma says she will make sure we are safe though. It is going to be really quiet in NY when we return, but at least Maisie and I have each other during the days. Last night Grandma had a few leftover scraps of salmon to add to our dinner. The smell was driving us mad and the taste was out of this world…wouldn’t mind having that every night!. OMG, Daphne is so cool. She scares me and excites me at the same time. I will follow her anywhere even if it looks dangerous. She can be so sweet and fun and then, for no reason, snap at me. I have learned she doesn’t mean it and I know how to run really fast and avoid her when she is snappy…like when we play Treibball. I swear she wants to kill it! I know you are having a bad time and I wish Phillip and I could cheer you up and wrestle for you. Grandma says I am the Energizer Rabbit and sometimes she has to get cross with me when I get too “busy.” I know she loves me though because she talks to us all the time. She calls us her McNuggets and Velcro Pugs. We didn’t like sleeping in the dormitory…I am not sure why but once we moved in with Grandma and Grandpa, we sleep like babies. I love you and miss you, but don’t worry about us…camp is great. I can hardly wait until I see you. Help me out guys…I am really at a loss trying to figure out females. I live with one, and now two more. Don’t get me wrong, I love them, but sometimes a fella’ just needs a little time out from all the drama. Maisie can be a really annoying little half sister and while I know she loves me to the moon and back, she never stops sniffing, licking, or chewing me. I am a pretty patient guy but there comes a point where I snap – not in a mean or nasty way – I just turn and give it back to her. And here’s the kicker, she loves this the most! So what do I do? All I really want to do for the day, and evening too, is nap – napping is good and I need a lot of it. Let’s face it, I am a lover and cuddler, not a fighter or athlete. If left on my own, I could cuddle and sleep away my life. At any rate, now that there are three females, I am beginning to feel sleep deprived. Cecily really doesn’t interfere because she is deaf and blind, but what she does do a lot is bark. I think I heard that Mason did that when he became challenged. She is a good cuddle partner though. Daphne, like I think I mentioned before, is a whole different class of dog. She doesn’t want to share space with anyone, prefers sleeping alone, and only plays with you when she is in the mood. We learned very quickly not to “poke the bear.” She is alpha dog with a capital A. We respect her and never overstep our boundaries. So you can see there are three very different personalities working on me. Now, the most fun for Maisie and me is when Daphne decides she is ready to play, and believe me, she plays hard! She has this disgusting old deflated, ripped, and shredded football that she loves to chase and chew on. When she runs after it we run for her, barking with all our might and nipping at her since we know nothing can keep her from that ball. We feel so brave and strong doing this since we are safe from any retaliation. I know, we are wimpy pugs but it does so much for our self confidence and allows us to have some interaction with our boss. Sometimes, though, she will get so fed up that she drops the ball and comes for us, giving that growl that comes from deep in her chest. Let me tell you, when we hear that sound and see her muscles bulging, we scatter like roaches. I know I sound like a sissy but really I am just protecting myself from harm. Daphne’s jaws are really terrifying. I’m not complaining because our days are actually pretty stimulating (probably more than I need) but we are a pack now, and as most of you know, pugs like big families. Grandma runs a fairly tight ship and she always has my back when there is ever an issue…probably because I am the only boy. She calls me “Philly Lou” or “Philly Gumbo” and I love it when she does. Oh, my name is Phillip, by the way…named after Phillip Lauer of Pupstarsonoma. He was the one who connected me to Mama after Mason died. I flew up to NYC from Arkansas and have never looked back. Thank you, Phillip, for putting Mom in touch with Barbara Lair, who breeds the most beautiful pugs in the world, if I do say so myself! At any rate, here are Maisie and I, the next generation of pugs, living a summer on Cape Cod…not too shabby! The downside is the sleeping situation. Grandma and Grandpa cannot and will not share their bed with pugs (something about not liking dogs sleeping on their heads or wrapped around their necks…weird, right?) So, we sleep in the “dormitory” with Daphne and Cecily (Grandpa’s office). Here is the real kicker…just because Maisie and I have had a few accidents up there, we have been put into diapers at bedtime. I am not embarrassed but Maisie is freaked out, hiding her head, looking away, and asking me to help her escape from them, the diapers that is. I help her and she helps me so that every morning when Grandpa comes for us, we are both without the diapers. I overhead Grandma talking about getting us onesies to hold them on us…oh well, the price we must pay, I guess. Tears continue to fall as I sit at my computer, writing for the last time, words about my beloved grandpug, Mason. As Mason’s “transcriber,” it has been my privilege for these many years to give him the voice he so rightly deserved. His passing leaves a gaping hole in so many of our lives and a silence that is nearly deafening. Never have I known an animal in such a tiny body to have such a powerful presence. He was engaging, charming, demanding, funny, loving (on his terms), masterful, beautiful, courageous, tenacious, and all-consuming. His connection to my daughter was something incredible to behold and I feel certain there never will be such a bond between any human and animal. Bringing him to life was a completely organic experience. He did tell me what he wanted to convey and always with a dry, sardonic, and somewhat jaundiced point of view. He was a gentleman but a glutton, a romantic but a pragmatist, a mastermind but an innocent. He was always a study in contradiction. To say that he will be missed, is a huge understatement. In time we will all be able to share the many Mason stories that have become part of his lore and cachet, but not for a while. Right now we miss him too much and feel his absence too greatly. I have loved sharing his life and telling his stories, and really grieve that there will be no more. I console myself with the knowledge that at least his voice was heard and loved by so many throughout the world. We all wish to thank you for your notes, letters, and comments throughout this very difficult time. Your words give us great comfort and peace, confirming what we’ve always felt about this little pug. Thank you for your loyal readership, support, and love. What a summer it has been, dear reader, and my silence is due only to Grandma’s endless stream of guests visiting on Cape Cod. We were fortunate enough, however, to manage four visits and enjoy all of the pleasures this beautiful strip of land and sea offer. And while I would gladly regale you with tales of my chivalrous and exemplary conduct, I fear the opposite is more the case. Returning to New York always puts me in a more– how should I phrase this?–aggressive and machismo state of mind. The mellowing and soporific effects of Cape Cod go by the wayside once we cross the Triboro Bridge and zoom down the FDR Drive to the Lower East Side. The difference is palpable and this old pug knows the route like the back of his paw. Living in Gotham requires a fortitude and quickness of reaction that is like nowhere else on earth…and so I become Devil Pug! It is not something of which I am proud, but there it is, dear reader, a fact of my life. I am ashamed to confess that I did the unmentionable, the unthinkable, the most abhorrent of all crimes…I bit the hand that feeds me, my dearest and most loving mother’s. It was on a Saturday morning when we always lie in bed and play – I, on my back with four little legs pedaling the air wildly and mouth agape, exposing the few little tooth like stumps remaining in my head – that I chomped down on her index finger like a Wolverine, never dreaming for a second that my bite had any teeth (so to speak). Well, blood came forth as my mother yelled in great pain. I am a monster, a devil, an evil creature with no means of atonement. And without prolonging the suspense, Mom ended up in the emergency room Sunday morning with a significant infection in her finger for which she received both antibiotics and a tetanus shot. Another incident proving my satanic qualities is my seizure of the loaf of bread she brought from California for Dad. She, without thinking, thought the bread was secure (you will remember my bread episode of several years ago that sent me to the ER) and of course it wasn’t. 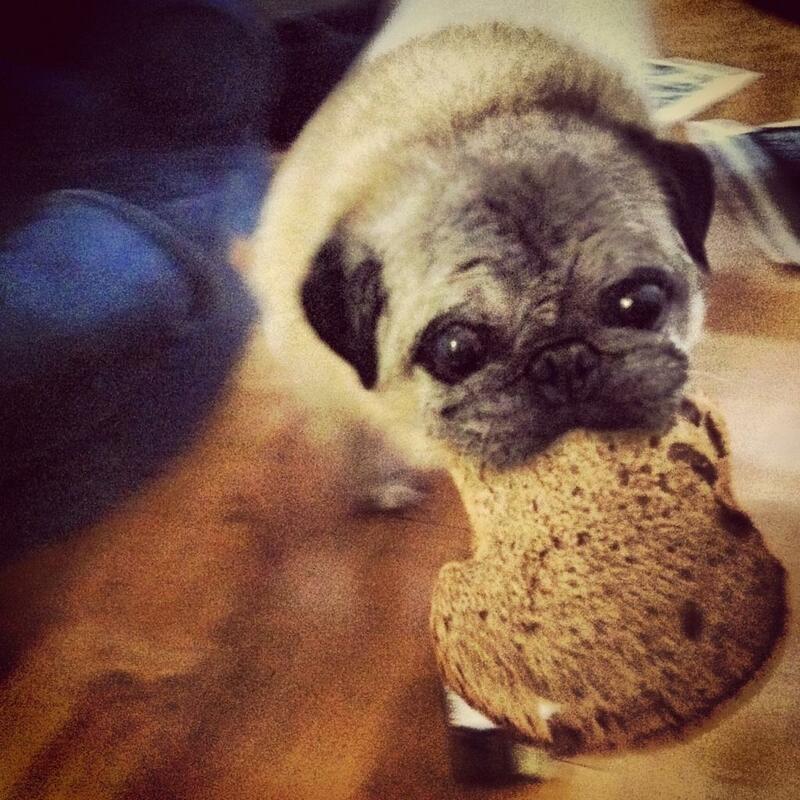 It was laden with seeds, nuts, and other delicacies not fit for a pug. I proceeded to gorge until I was discovered. You would think I had learned my lesson but here is the thing about pugs, dear reader, we have no memories of unpleasant experiences…only of pleasant ones. I remember that bread tastes good but not that I was deathly ill from ingesting it. I will continue on my hellish, bullish way, climbing over Lizzie as if she were merely a bump in the road and something to overcome. I will use her as a pillow or else ignore her completely. And while I am not the vilest of all creatures, I am certainly deserving of my sobriquet in today’s blog title. A Pug's Voice – The Next Generation · A pug speaks eloquently, honestly, and freely about the joys and vicissitudes of his life.